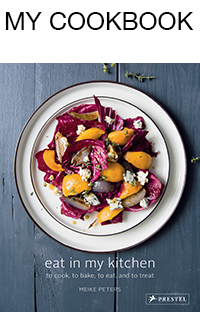 This Austrian classic is one of the best dinner party crowd pleasers when the night calls for an easy rustic dessert. So many people have sat at our table and enjoyed this dish which is basically a torn up pancake. 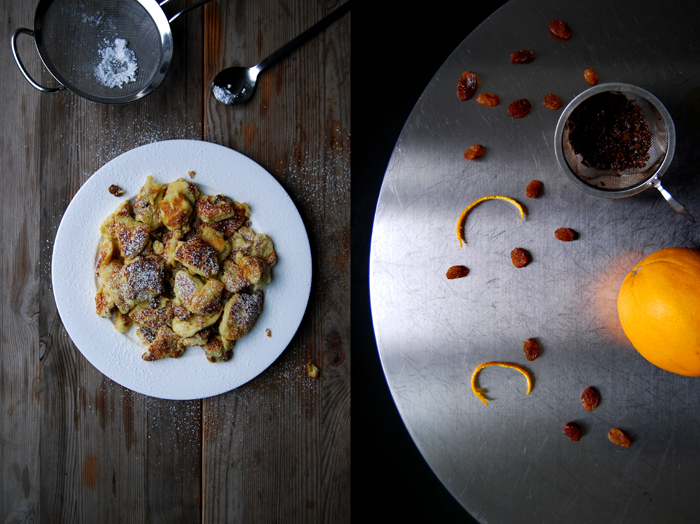 Every time I serve Kaiserschmarrn, it creates a joyful silence in the room that only moments of happiness and culinary satisfaction can create. Moments that remind us of our childhood food and memories, when our mothers would turn the kitchen into the best smelling place in the world on a Sunday morning – simply with some pancakes on the cooker! 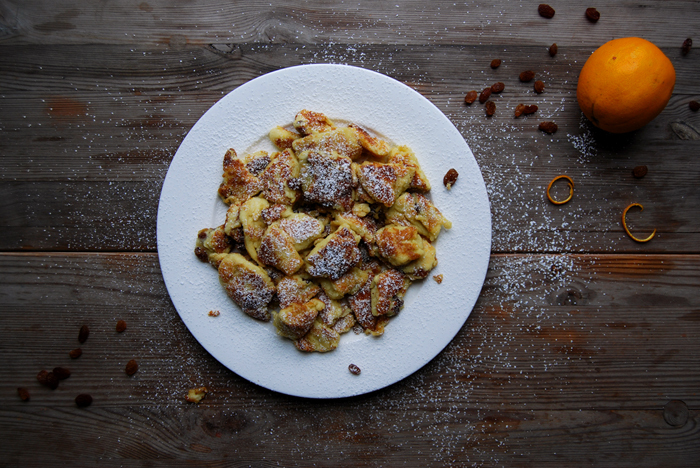 Kaiserschmarrn is the Austrian take on this nostalgic treat. 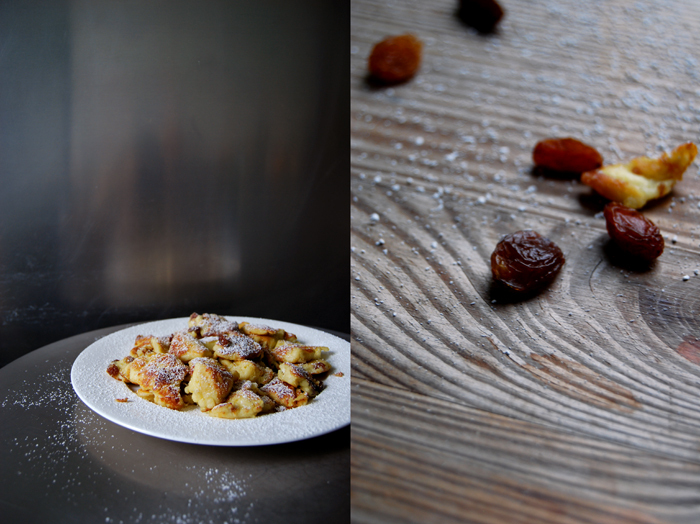 The fluffy pancake is refined with raisins and shredded with two forks after it turns golden buttery brown. Its name comes from the Austrian Kaiser (emperor) Franz Joseph I of Austria. He used to love this dessert so much that people referred to it as his folly (Schmarrn in Austria and Bavaria). I feel with the emperor and I can easily call it one of my sweet follies! 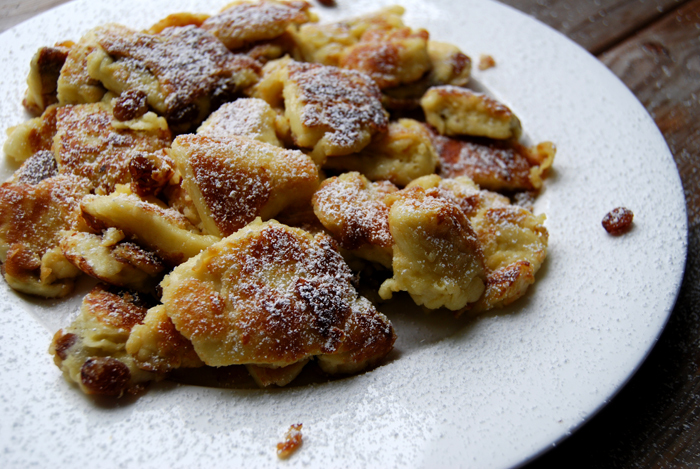 I’ve had so many Kaiserschmarrn in my life, that it’s good to bring in a change once in a while. Sometimes I add fresh fruits, like apples, berries or plums, or spices, like cinnamon or cardamom, but for the one that I will share with you today, I soaked the raisins in Darjeeling tea with strips of orange. Soak the raisins with the orange peel in the tea for 10 minutes. Beat the egg whites with the salt until stiff. Mix the milk, egg yolks, sugar and orange zest until combined. Add the flour and mix to a smooth dough. Drain the raisins and mix them into the batter. Gently fold in the stiff egg white with a wooden spoon. Heat 2 tablespoons of the butter in a non-stick pan. Pour in the dough and let it cook on medium heat for a few minutes until golden on the bottom. Turn the pancake, if it’s too big, cut it in half and turn it separately. Lift the pancake and add the remaining butter before you let it cook for a few minutes on the other side until golden. When the pancake is just cooked through, pull it into bite sized pieces with 2 forks and let them turn golden brown on all sides. I’ve never come across this dessert before but it sounds amazing; I can’t wait to serve this next time I have friends over! 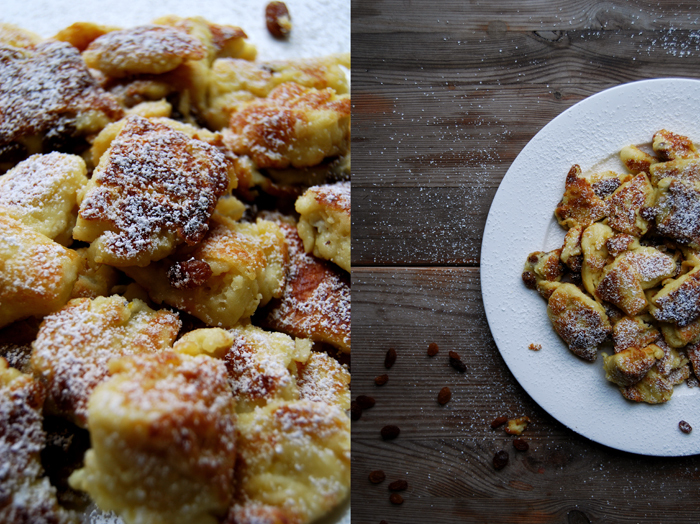 Kaiserschmarrn bewirkt bei mir das gleiche 🙂 und der Duft erst! Hab’ eine schöne Woche Daniela!